Senator Dino Melaye, representing Kogi west senatorial district has been in the news lately. He allegedly called Senator Oluremi Tinubu names during an explosive session of the National Assembly. Speaking with journalists in Abuja on Thursday, he refuted reports that he threatened, during a closed door session of the senate on Tuesday, to beat up Senator Tinubu and impregnate her. INFORMATION NIGERIA brings you up to speed with everything we need to know. 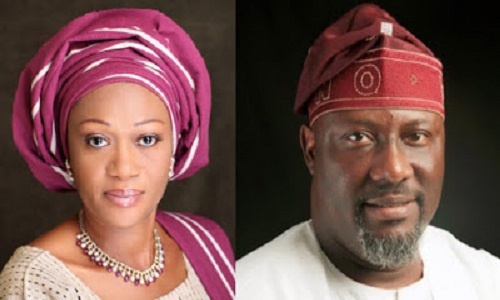 1.Mr Melaye says the allegation is malicious and a lie that he said he would impregnate Mrs Tinubu. 3.Melaye says everything started when told the senate that since it had passed a resolution saying that its rules were not forged, senators who went to court should withdraw the case of face suspension. 4.He said Senator Oluremi Tinubu got up and was recognised to speak and immediately she started speaking, she specifically mentioned his name. 5.And Mrs Tinubu said she said that she was being harassed in this chamber by Senator Melaye at this point. “She went ahead to say that why would he come here and be threatening senators and there was a large chorus from senators. At that point I was still calm. She got up again and said that this thug must be tamed. At that point, I got up and told her that she was very stupid.